Waiting around every corner of Singapore is a new experience; something different than the last in the form of food, culture, shopping, history and nature. This is, in part, thanks to the city-state’s array of diverse neighborhoods, offering something for almost every type of traveler, whether you’ve come to shop until you drop, explore the island nation's history, or dive into the city’s famous cuisine. As small as it may seem, Singapore packs in a dizzying array of attractions. Whether you’re visiting for a few days or a few weeks, here are eight of the best neighborhoods in Singapore you need to see. 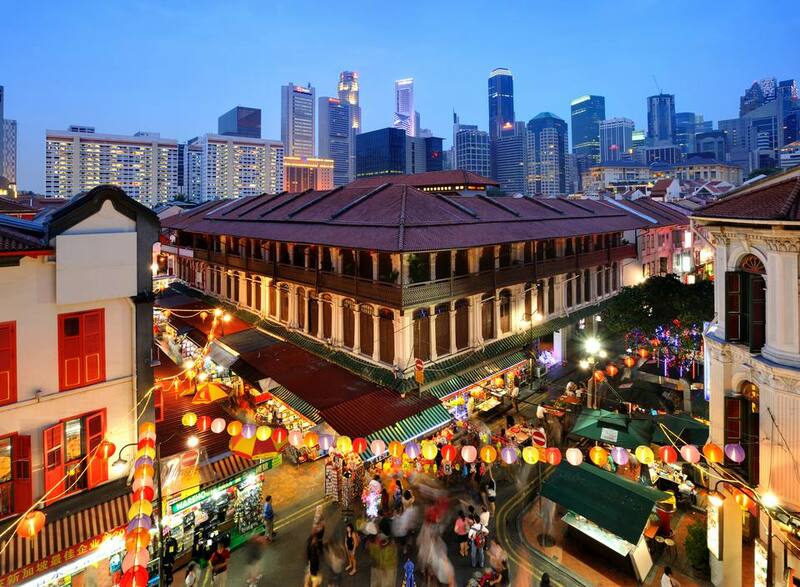 A fascinating blend of old and new greets visitors in Singapore’s bustling Chinatown, a haven for foodies, shoppers and history buffs. Get started at the Chinatown Heritage Centre to learn more about Chinese culture and see how early Chinese migrants to Singapore once lived. Foodies will want to bring their appetites to Chinatown Food Street (CFS) located on Smith Street, where you can choose from a wide range of eateries and food stalls. Or check out the nearby Maxwell Road Hawker Centre, one of the oldest and largest hawker centers in Singapore and home to some seriously tasty local dishes at wallet-friendly prices. Avid shoppers take note; Orchard Road is the ultimate browsing and buying destination in Singapore. Known for high-end boutiques and gleaming malls that beckon shoppers, this is Asia’s most famous shopping street. Accessible via three MRT stations, Orchard Road consists of well over 20 shopping malls and six shopping centers, including the futuristic-looking ION Orchard with its glass, steel and marble façade and eight floors of shops. This is also where you'll find the ION Sky Observatory offering Instagram-worthy 360-degree views of the district below. If you get hungry, malls here have diverse food selections, many of which are much more affordable than you might think based on the surrounding brands staring back at you. Get ready to see Singapore in a whole new light with a visit to the city’s vibrant Little India neighborhood. The historic area along Serangoon Road and neighboring streets is the heart of Singapore’s Indian community and a great place to base yourself for affordable accommodation and delicious food. As you explore you’ll come across Sri Veeramakaliamman Temple, one of Singapore’s oldest Hindu temples; 24-hour shopping at bustling Mustafa Centre; Tekka Centre hawker market; and a tempting array of Indian food at affordable prices. Tiong Bahru has the distinction of being one of the hippest neighborhoods of Singapore, something that becomes evident as soon as you start exploring. It’s also one of the oldest neighborhoods in the city, which gives it a unique blend of historic and modern. Spend some time here seeing what surprises await down Tiong Bahru’s quiet streets since you never know what you might come across, be it a chic café, art gallery or cute independent boutique. In the heart of the neighborhood you’ll also find Tiong Bahru Market, a massive wet market and food centre, which makes for a great place to fill up on local foods like chwee kueh (steamed rice cakes topped with preserved radish). Bustling, trendy and vibrant, the Marina Bay area of Singapore never fails to impress, no matter how long you’ll be spending in the exciting neighborhood. One of the most noteworthy buildings here is the Marina Bay Sands. Not only a luxury hotel, the impressive property is also home to one of the world’s largest rooftop infinity pools (for hotel guests only, unfortunately), luxury shopping, and the ArtScience Museum. Also in the area are the sprawling Gardens by the Bay, something not to be missed for the awesome Supertrees—tree-shaped vertical gardens that are between nine and 16 stories tall. Marina Bay is also home to popular food market Lau Pa Sat (open 24 hours a day), and iconic Merlion Park (take a selfie with the iconic Merlion fountain while you're there). If it’s fun, relaxation and entertainment you're looking for on a trip to Singapore, you’ll find it on Sentosa Island. The island is just 15 minutes away from the city centre via a short monorail ride from VivoCity or a scenic cable car ride from Harbourfront. Known as the “State of Fun,” Sentosa Island is home to three golden sand beaches, themed attractions like Mega Adventure Park (home to southeast Asia’s steepest zip line) and Adventure Cove Water Park, golf courses, spas, restaurants and walking trails. Needless to say, you won’t be bored on Sentosa Island. Formerly a nutmeg plantation in the 1850s, and then repurposed as a military camp, Dempsey Hill is a lesser-known neighborhood when compared to other more popular areas like Chinatown or Marina Bay, but that doesn’t make it any less interesting. In fact, there’s enough to see, eat and do here that you could spend an entire weekend exploring. Dempsey Hill is located just minutes away from the shopping mecca of Orchard Road, but it offers a much lower-key experience, tucked away amidst relaxing greenery. Browse antique shops and small boutiques selling items you might not find elsewhere. Check out some of the walking trails to really get a feel for the area. Located just opposite of Dempsey Hill you’ll find Singapore Botanic Garden, a green oasis in the city and well worth allotting a couple of hours for. Admission to the Botanic Gardens is free for all garden areas except for the National Orchid Garden. Known as the historic birthplace of modern Singapore, the area north of the Singapore River and between City Hall and the Dhoby Ghaut MRT stations is brimming with some of the city’s best attractions. Here you’ll find iconic Raffles Hotel (stop in for a Singapore Sling), the National Museum of Singapore, Asian Civilisations Museum, Fort Canning Park and Singapore Art Museum (which houses the world's largest collection of Southeast Asian art)—just to name a handful of worthwhile sights. There are several upscale hotels here, as well as the Victoria Theatre and Concert Hall that was built in 1862, Esplanade – Theatres on the Bay, and Suntec City (one of Singapore’s largest shopping malls. ).